Do you sometimes lose motivation to practice guitar? We all do. When this happens, it takes longer to become the guitar player you want to be – and that’s frustrating. Why does this happen to us? There are 5 reasons. When you learn what they are and how to overcome them, practicing guitar gets easier… and you get better faster. Reason #1: You don’t know what to practice on guitar to become the guitarist you want to be. When you don’t know what to practice to reach your goals, it’s tempting to look for answers from many different sources. As a result, you end up having too much “stuff” to practice. Slow progress - When you practice too many things, each item you practice gets less of your attention. You also often practice things that you are not ready to practice yet (without realizing it). This means you have less time to practice skills that can actually improve your guitar playing the most right now. What this really means for you is: you make less progress. Slow progress makes your motivation drop even more. Solution: Find a proven guitar teacher to learn the exact skills you need to play guitar the way you want. Your guitar teacher should tell you what things to practice and what things to ignore to become a great guitar player as quickly as possible, without wasting time. When you know what these things are, focus on them like a laser and ignore everything else. This helps you make faster progress and enjoy the process of becoming a better musician. Reason #2: You try to reach your musical goals without effective guitar practice schedules. You want to feel certain you are improving every time you practice guitar, correct? To feel this way, you need to know exactly when to practice the materials you want to work on, the right order to practice them in and the amount of time to spend on each one. You learn this by creating effective guitar practice schedules. This helps you maximize your available practice time and makes you a better guitarist even if you have little time to practice. Dividing your available practice time equally among your practice items. This is similar to cooking a meal by using the same amount of every ingredient, without considering how each ingredient affects the taste of the food. Only practicing things you want to practice and ignoring the skills you need to practice to reach your specific goals. This makes your musical skills out of balance and your weak areas keep you from using your stronger skills to their full potential. It’s frustrating to be advanced in some musical areas, but feel like a beginner in other aspects of your playing. Reason #3: You don’t enjoy the process of practicing guitar. You like to do more of the things you enjoy and avoid things that are not fun, right? To enjoy guitar practice, you must make it effective and fun at the same time. Avoid mindless practicing. Mindless practicing is about playing the notes of an exercise without paying attention to what you are doing. This makes practicing feel like busy work and creates many bad habits in your playing. Practice guitar based on a strategy designed specifically for you. Have an expert guitar teacher design the path for you to follow to reach your goals instead of relying on trial and error. This saves you time and makes guitar practice feel much easier. 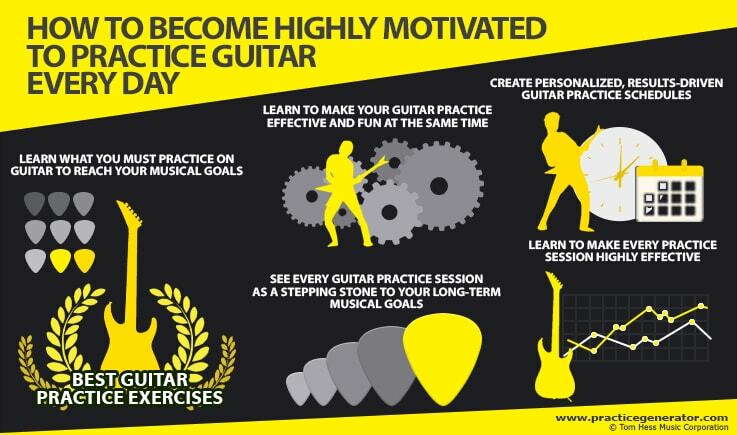 Want to make your guitar practice the most enjoyable part of your day? Take this 2-minute guitar practice quiz to learn how to improve faster and love every step of the process. Reason #4: You have forgotten the true reasons why you practice guitar. To become a great guitar player, you need to set specific goals you want to achieve and practice effectively to reach them. You lose motivation to practice guitar when you stop focusing on your goals. This turns your guitar practice into a boring chore without direction or purpose. What is my skill level with this item? Is this item part of my long-term or short-term musical goals? Is this item more or less urgent than other items I'm practicing? How well can I focus on practicing this item for long periods of time? How many days per week can I realistically work on this item? This mindset helps you improve every time you practice guitar, one practice session at a time. Reason #5: You lack perseverance & consistency in your guitar practice. Becoming a great guitar player takes time. You can’t expect instant results even with the most effective guitar practice methods. You need patience and perseverance to allow big results to appear. You can tell if you lack perseverance in your guitar practice when you jump from one practice method to another without consistency. Lack of consistency makes your musical progress slow and lowers your motivation to practice guitar. When you increase your level of perseverance, your guitar playing improves faster and you stop feeling frustrated with yourself as a musician. Read this article to develop the perseverance you need to become a great guitar player. Want to love the process of practicing guitar again? Take this guitar practice quiz to learn exactly how to speed up your progress and make guitar practice the most enjoyable part of your day. 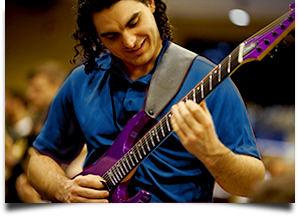 Make faster progress in your guitar playing with the best guitar lessons online.